How should we define and measure randomness? Ever since Americans were sent into a tizzy over that little “taxation without representation” issue with King George, we’ve obsessed over democracy and freedom of choice. Naturally, we assume that more choices and more freedom to evaluate and select them is unqualifiably better. Until a few years ago, I would have agreed. Then one serendipitous day, I met TED.com and watched my virgin TED Talk - Barry Schwarz’s “Paradox of Choice”. His point was clear. Our cognitive faculties evolved in an era with far fewer decisions and are poorly suited to deal with today’s glut of information and decisions. A recent podcast from WNYC Radiolab (best podcast production values this side of the YouTube era) and a recent conversation with Shane Lofgren and Daniel Bachhuber on the cognitive surplus and wasted “cognitive cycles” caused me to revisit the issue. In the podcast, British neurologist and popular author Oliver Sacks describes his practice of purchasing the same, one-week supply of groceries every Sunday in an effort to reduce the cognitive cycles he spends on food decisions. Sacks points out that he feels no less joy with the same meals every week. In fact, by avoiding the slight amount of stress and regret that can go into eating decisions, he believes he’s actually happier with less choice. Now of course Sacks made the choice to adopt this strategy in the first place and made the initial choice of which foods we would purchase each week, but the key idea still emerges. Not all choices are better served by more options and more freedom. Our time is valuable and there are choices we want to spend time making and choices we don’t. 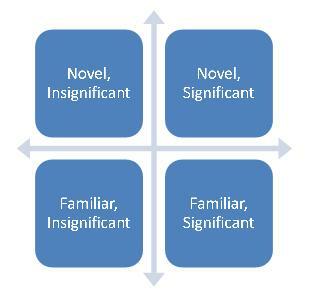 I like to think of choices as existing on a Cartesian Choice Plane with two parameters: Significance and Novelty. Novel, significant choices are those requiring the most time input. You’ve never encountered them before, but their consequences are meaningful to you. You’ll need to invest your time and mental effort to evaluate a series of possible decisions and select the “best” one based on your predictions of their effects. These vary by person but range from choosing a job and spouse to purchasing Christmas gifts. Novel, insignificant choices are the most distracting and misleading. You’ve never encountered them before so their novelty grasps your attention. Yet, at the same time, they’re not especially important to you and have few significant consequences for your life. You’ll want to make these with little investigation of time investment, perhaps based on friends’ recommendations or initial reactions. These likely include purchase of a case for your new iPod, ordering of food at a foreign restaurant, or choice of wrapping paper. Familiar, significant choices are also very important. You encounter them often but each time, their consequences are meaningful to you. They are the daily decisions that you hope to develop as “good habits.” You might invest the time to make these decisions once and from that point on, react in the same way each time, periodically re-evaluating whether this is still the “best” choice. These choices include exercise and healthy eating. Familiar, insignificant choices are pretty uninteresting. You’ve seen them before and you really don’t care much about their outcome. You might choose to respond in the same way every time (eliminating the time burden this choice places on you at all) or you might choose a “randomly selected” response each time to mix it up. The key is not to invest too much time here. These choices include which pen to use to write a letter, which mug to use for your coffee, and which brand of kidney beans to select at the grocery store. So which decisions do you prioritize?